Last week I posted about using a single DecoArt stencil to create many different prints with the gelli plate. I used some of those prints to create the four collages that I showed in my last post. Later in the week, I decided to push the experiment further. When my fall classes were in session, I had taped a sheet of paper from a large roll that I had onto one of my studio tables. That paper had been used already to deposit surplus paint from my brayers. I had also scribbled some random pencil marks on top of the color. As a result, I was starting with some overall color and marks, but very random and unplanned. 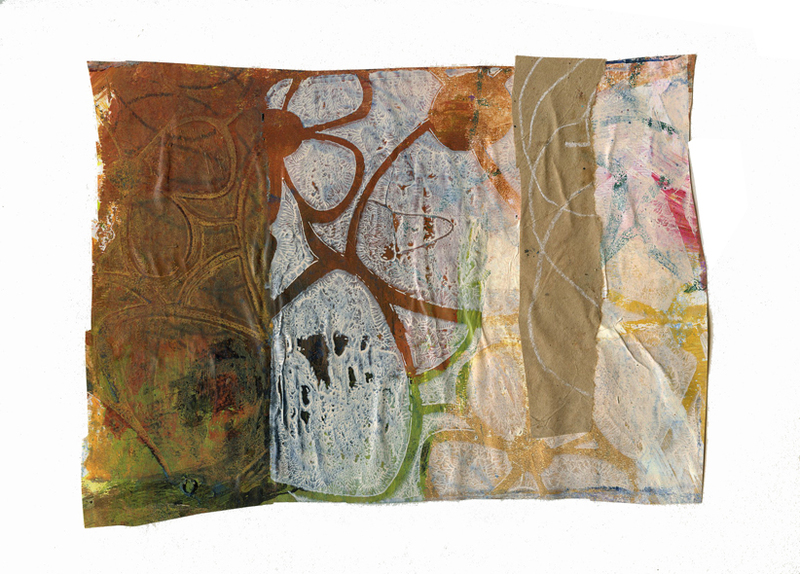 Using the gelli plate as a stamp, I covered the paper with monoprints in different colors, sometimes overlapping them. Some of the prints were ghost prints, and some were a first print, and some were layered prints. But throughout the exercise, I used the same stencil. 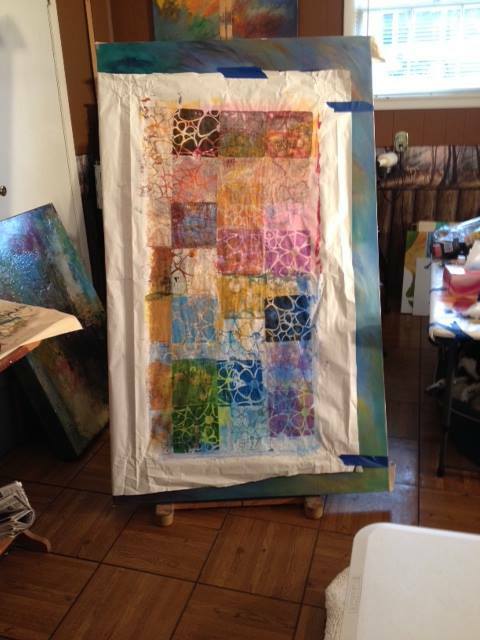 To use the gelli plate as a stamp, simply get a sheet of plexi just a little larger than the gelli plate. 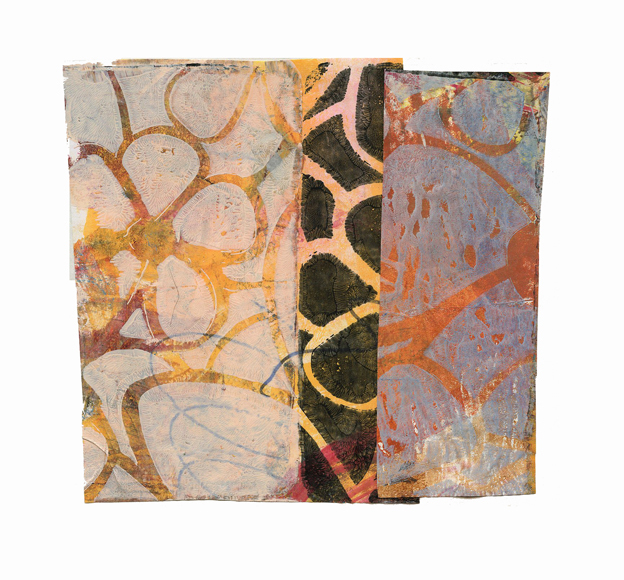 With just a little pressure applied first, the gelli plate will adhere to the plexi enough to invert it and stamp your print onto a surface such as canvas, etc. Here is the finished sheet taped to a canvas so I could photograph it. At this point I liked the big sheet intact, without cutting it apart. But that wasn’t my original plan. So here are some of the resulting collages that I got from it. I am thrilled with the all of the possibilities using just one stencil. Stencils made commercially never figured into my thought process until now. But as you can see, you truly can make them your own. I hope you’ll experiment with some of these ideas and let me know what happens. I love this idea, thanks so much for sharing it. I’ve been disappointed with the gelli surface and had reverted to my original process which I’ve renamed ‘Non-Gelli’, 😆 Now I can see some real possibilities for using it. Thanks, Myfanwy. 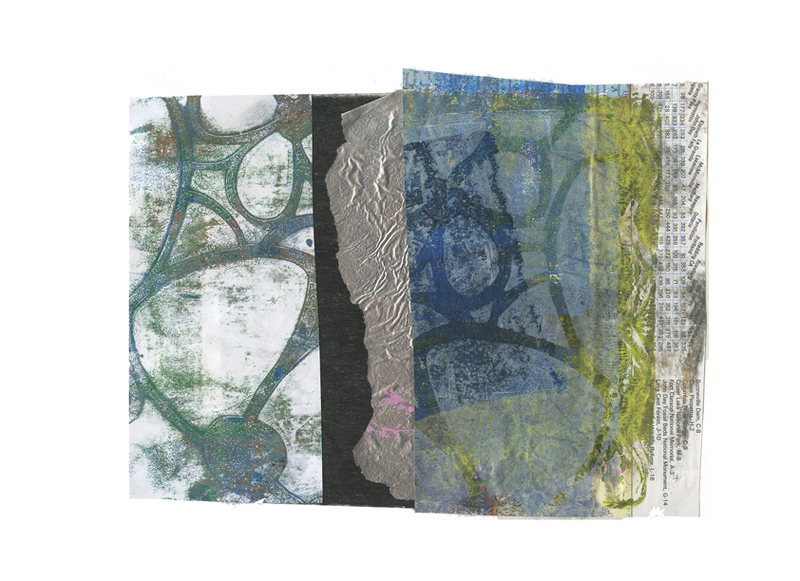 Re the gelli, I used to do my monoprints or monotypes on a simple smooth piece of plexi. 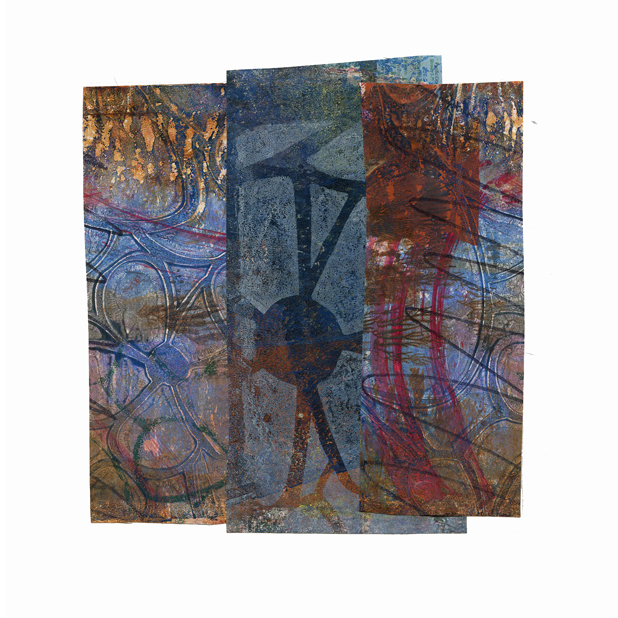 It works well, but the gelli plate or even a regular gelatin plate has the added advantage of being more sensitive to stencils and masks, making the edges more defined. However, there’s no end to what one can do with just paint on a plate. I love what you’ve done! I love that the stencil gave the collages a wonderful sense of unity amidst all the different color and textures. Really great technique. Thanks! Next I want to make a few more of my own stencils. I love this. I haven’t done any printing in years. I think the last was intaglio. 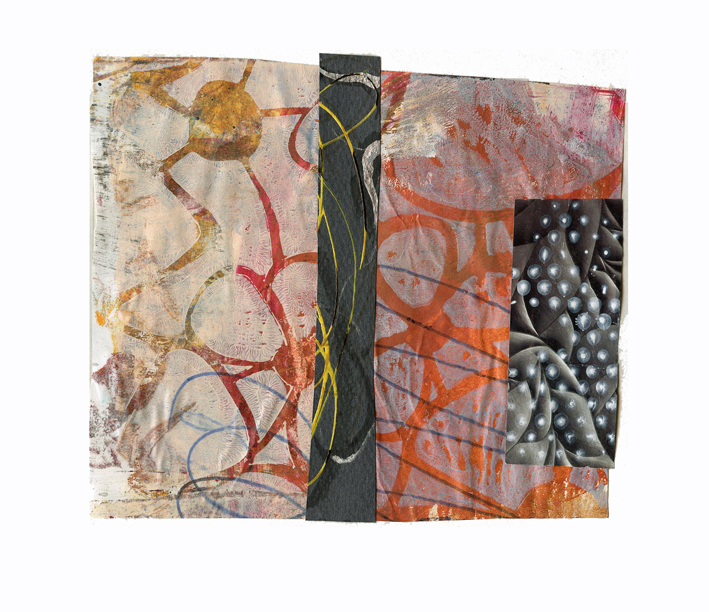 I didn’t know about this gelli, brilliant. I will be giving this a try. Thanks for sharing your beautiful work. I love anything involving printmaking. Something magic happens when parts of the process are left to chance. As always, you rock! I love what you’re doing with one stencil and a whole lot of imagination and creativity. Thanks! I never thought about using commercial stencils in my work, but found out that you can make them your own with unusual treatment.